This species is generally similar in appearance to E. glyptosperma, except that it is not scapose--the flowers are borne on branched, leafy stems. It occurs from the southern Mojave Desert south along the east side of the Peninsular Ranges just into northern Baja California Sur, in the mountains to the east of the Salton Sea, and at a locality along the coast of Sonora. PLANT annual, 0.5-3 dm tall, erect, glabrous or glaucous. LEAVES basal and cauline, terminal divisions acute. INFLORESCENCE cymose or solitary. 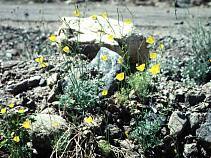 FLOWERS nodding in bud; receptacle conic; calyx long-pointed, glabrous or glaucous; petals 1.5-3 cm long, yellow. FRUITS 5-7 cm long. SEEDS 1-1.4 mm diam, spherical to ellipsoidal, reticulate, tan to brown. 2n=12. Desert slopes and hillsides; 0-1200 m. Sonoran and Mojave deserts of California; e Baja California, w Sonora. Plants of the El Paso and Rand Mts. 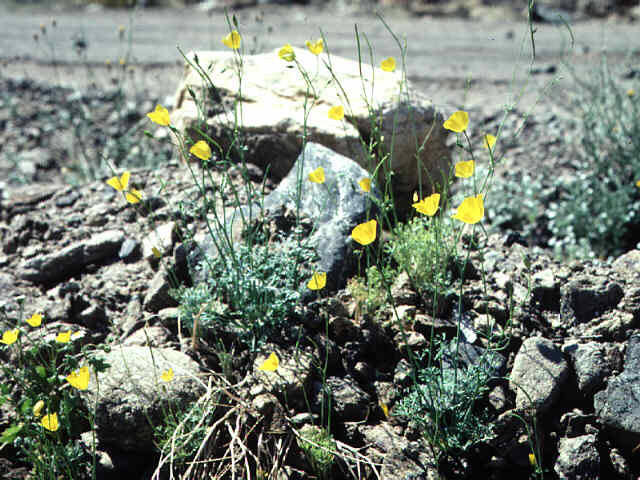 in the western Mojave Desert sometimes referred to this species are E. minutiflora subsp. twisselmannii.